THE HOUSE of Lords has rejected an amendment to the Brexit bill which would have pushed for the UK to remain in the single market after leaving the EU. Peers voted overwhelmingly against the proposal this evening, with one frontbencher slapping it down as “unrealistic”. By a margin of 299 to 136, with a majority of 163, peers chose not to slow down the bills passage through the House after it successfully passed through the Commons earlier this month. 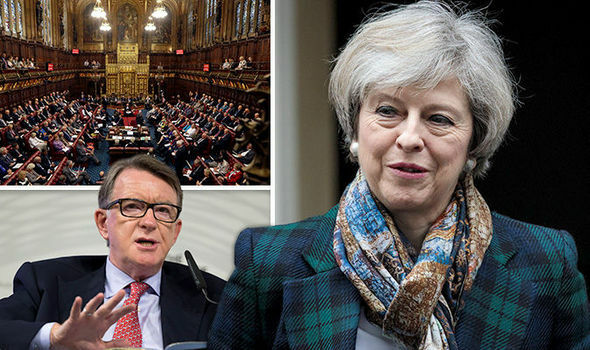 Nonetheless, the move did expose deep divisions within Labour as former Cabinet ministers Lord Hain and Lord Mandelson spoke in support of the change - contrary to the frontbench stance. In total, some 33 Labour peers backed the unsuccessful amendment, including Lord Hain, Lord Mandelson, Lord Cashman, Lord Bragg and Lord Foulkes of Cumnock. One Tory peer, Baroness Wheatcroft, also voted for it. The Government is expected to face sterner challenges in the days ahead on key issues such as having a "meaningful" parliamentary vote on the Brexit deal and allowing EU nationals resident in the UK to remain.